The post DIY – How To Make: Doll Distressed Jeans And Stylish Sweater | BACK TO SCHOOL Outfit appeared first on Saif Ahmed Khatri's Blog. 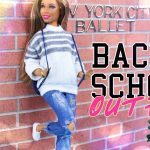 This entry was posted in Opinion and tagged BAFC, Distressed, Diy, Doll, Jeans, Outfit, SCHOOL, Stylish, SWEATER. Bookmark the permalink.